When it comes to building your dream home, working within a budget is a definite sore point. You may find yourself compromising on a lot of things that you once thought were absolute necessities. But as we've seen here on homify, time and again, a limited budget does not need to mean compromises at every step. It simply means smart design and investing in the right things. 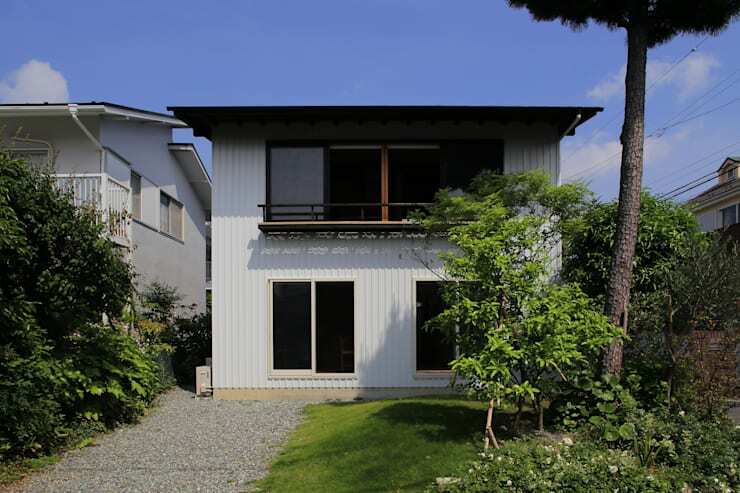 On today's 360°, we will look at a Japanese home that cost the owners a total of 15 million yen—that's not even HK$1,200000. 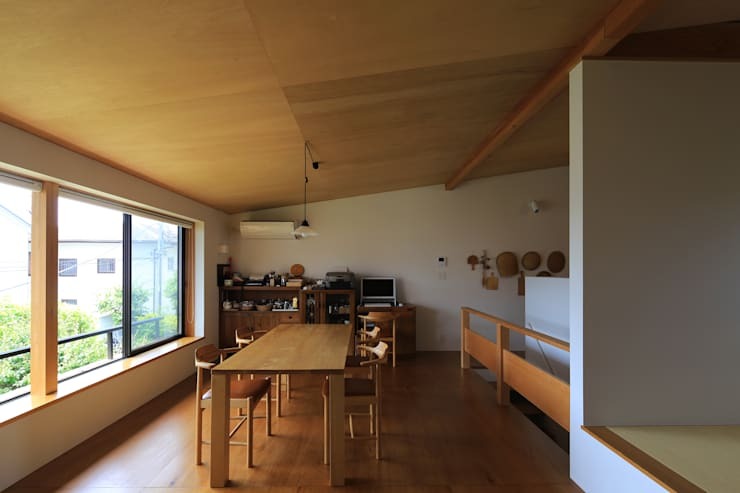 Designed by Yujiro Hayata, this simple and unassuming home stands over a plot of 122sqm and has all the comforts you would associate with a home built for triple the cost. Let's explore this low-cost, high-impact family home and find out how the architects managed to pull it off. When the project fell into the hands of the architects, they were asked to refurbish an old structure that was built over four decades ago. The owners wanted it suitably modernised, but also wanted to retain many of the erstwhile structure's features. The facade therefore looks a lot like its previous avatar, except for the addition of the modernised windows and terrace. The two-storey home though has expanded its living space to now accommodate 82sqm. The facade is made out of galvanised steel, a low-cost option that also requires less maintenance and lasts a lot longer than other alternative coatings. Step inside the house, and you are greeted by a warm and cosy space that invites you to kick back and relax. This room was designed as a study and a recreational space where the owners could retire to. Much of the wall space is taken up by book shelves. A grand piano and a secretary desk (not seen in the picture) occupies the remaining space; both are heirlooms and antique pieces that the owners inherited. The entire room is tied together by its extensive use of wood, which is highlighted further by the light streaming in through the open sliding glass doors. This bright living area is situated on the second level where the slight slant of the roof gives the whole space an interesting visual element. Once again, timber is the material of the day— it clads the floor, the ceiling, the balustrade and even the furniture. To avoid clutter in a limited space such as thing, the architects chose to tuck away most of the furniture, except the dining table, to one corner of the room. This allows enough room for movement around the whole area. If you like the furniture seen here, check out more here. Stepping away from the norm, the architects chose to construct the bedroom in the lower level as this would give the owners easier access to the garden. By designing the bedroom upfront in north-facing home, the architects also ensured that this space would get direct sunlight throughout the day, especially in winter when the sun is low. The decor has been kept minimal; there is no complicated details or excessive ornamentation. 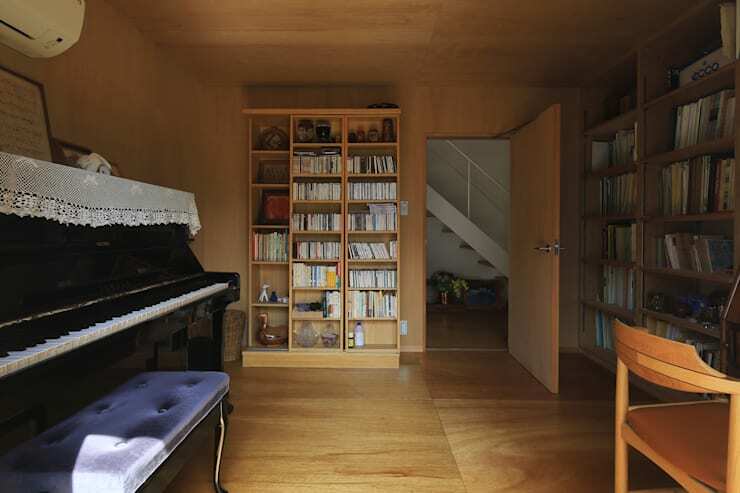 Tatami mats cover the floor while inbuilt cupboards avoid wastage of space. The wooden surfaces add to the cosy and warm ambience. Here you can see both the kitchen and the meditation space, both of which are separated by a simple white partition wall. The kitchen is placed behind the stairway and is kept simple, with clear lines and the predominant use of white. 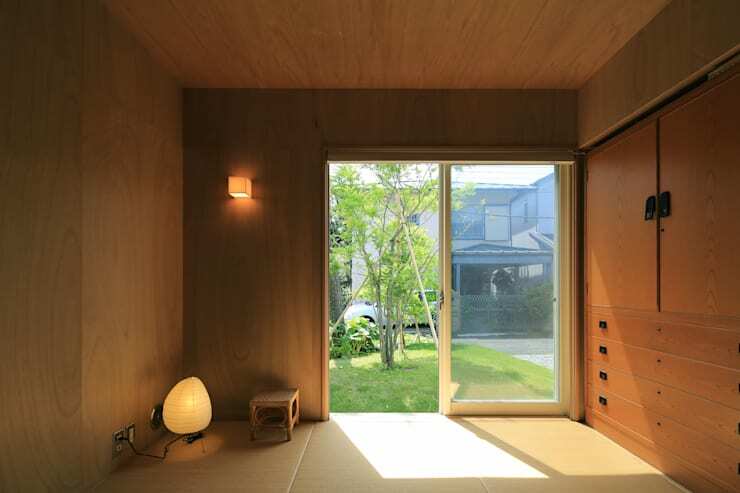 Adjacent to it, the tatami room is a rather versatile space where the family can also entertain guests. You can see how the architects have crafted an inviting home by investing in the right materials and by choosing to keep things simple yet impactful. 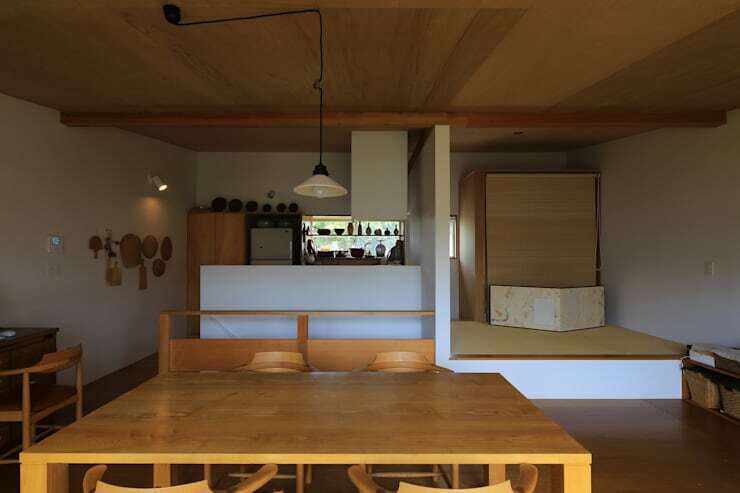 To see another minimal, gorgeous home, check out A light-filled family home in Japan. What did you think of this tranquil family home?